Massive amounts of dead fish from toxic red tide algae are continuing to wash up on the shores of Florida. Now, the deluge of dead fish has been moving north along the state’s coastline, showing up in Holmes Beach in Bradenton, ABC Action News reported on Aug. 6. The Holmes Beach Police Department stated that there is a large cleanup effort. “The first Beach cleanup will be tomorrow, Tuesday morning, at 8 a.m. We will be meeting at the 52nd street Beach access. Thank you to everyone who is volunteering their time!” the department wrote on Aug. 6. “It’s nerve-wracking cause you don’t how long it’s going to last, red tide is unpredictable, you have no clue how long it will last,” said Captain Kathe Fannon to the ABC affiliate. The National Weather Service in Miami issued a beach hazards statement on Monday, for red tide in Collier County until Thursday evening. The agency warned that there could be respiratory irritation in some coastal areas, which includes Collier. 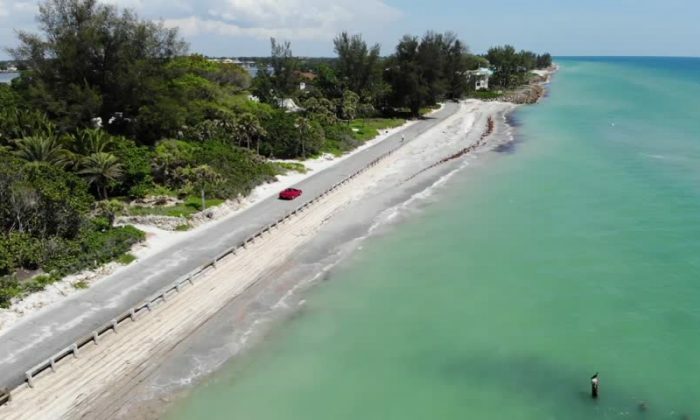 Respiratory irritation and murky clumps of red drift algae have been reported from Collier to Sarasota counties, which is usually known for its stunning beaches. “We came for the shark teeth, but we’re going to have to move somewhere else,” said Sol Whitten, who came from a county north of Tampa with his wife, six grandchildren and his daughter-in-law, reported the Herald Tribune. Red tide is a “harmful algal bloom,” according to the National Oceanic and Atmospheric Administration. It says the blooms start when the colonies of algae grow out of control and create toxins that harm and even kill marine life.